On the occasion of Guru poornima, a special lecture was arranged on 27.07.2018 by 9.30 a.m. entitled “Guru Mahima” by Kendra Karyakartha Shri.D.Natarajan for the students of Sundararajapuram Corporation Higher Sec., School. 450 students from classes 6 to 12 attended the function. Shri. D. Natarajan lively shared the very essential virtues to be nurtured among students in a wonderful manner which was enjoyed by all the students. On the Guru poornima day, 27.07.2018 at Balaji nagar karyalaya function started with Bhajan by 6.30 pm. Sanskaravarg children beautifully enacted a small drama on the story of Ekalavya. The motto of the program was conveyed by Kendra Karyakartha. Shri.Dr.Elango, Former Vice President, Vivekananda College delivered a lecture on the topic “ Guru Mahima”. More than 75 people attended the function and they all did pushpanjali to Omkar at the end of the function. Guru poornima function was arranged at TVS nagar karyalaya on 28.07.2018. The function started with Bhajan by 6.30 pm. The motto of the program was conveyed by Nagar Pramukh. It was followed by a small drama on the story of Shravana which was enacted by sanskaravarg children. One of the well-wishers of Kendra Shri.Somasundaram ji addressed the gathering including the sanskaravarg children. 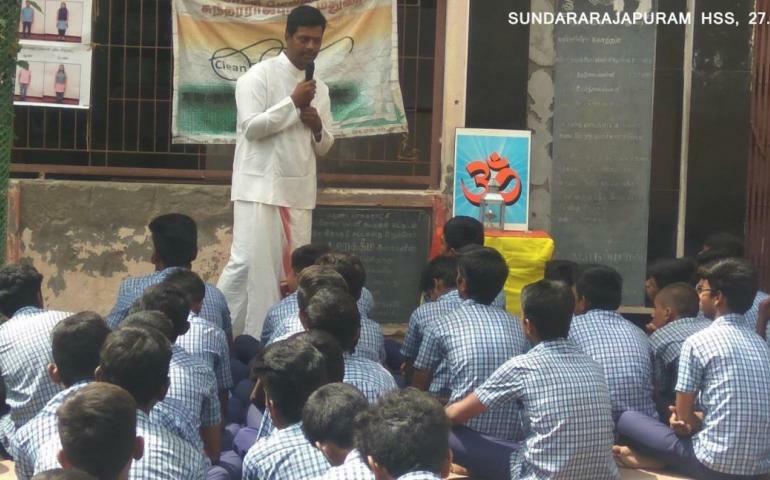 He made an interactive session on the topic “Guru Mahima” by sharing his experiences. Prasad was given at the end of the program for all the 30 participants. Another swadhyay program was arranged at Chokkikulam Karyalaya. Three people came together on 29.07.2018 at Chokkikulam karyalaya and they read and discussed Kumari. Nivedita Bhide’s (Vice President of Vivekananda Kendra) message to Karyakarthas regarding Gurupoornima Diwas.